Flying Doctor Telehealth provides access to online telehealth appointments for patients in rural Victorian communities with a Geriatrician. Patients with conditions such as EOD (Early Onset Dementia), Osteoporosis, or those who require medication reviews or advice regarding continuing care are suitable for telehealth appointments. Flying Doctor Telehealth provides an appointment facilitator to book and join appointments for patients, at their local health service. 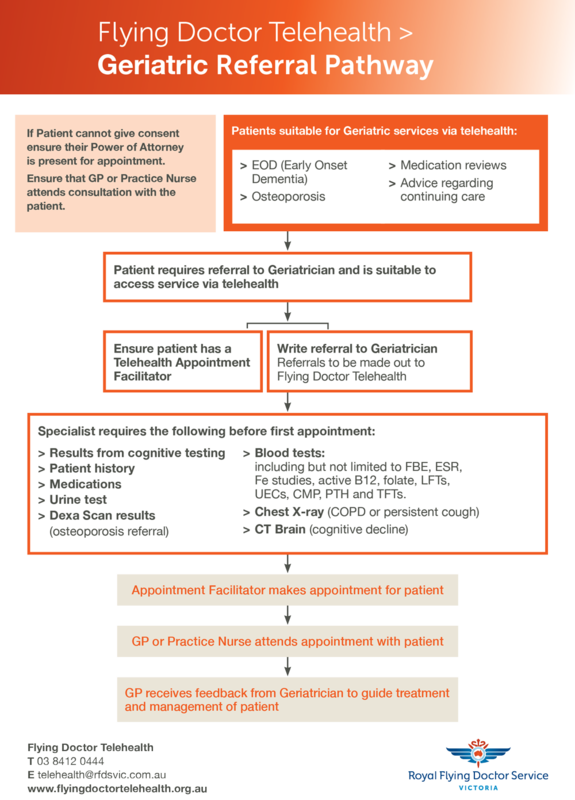 Royal Flying Doctor Service Victoria partners with Geriatrician Dr Ramila Varendran. Dr Ramila Varendran is a geriatrician who provides assistance with managing patients with multiple co-morbidities that result in functional decline associated with age. Ramila has a particular interest in dementia, osteoporosis, reducing polypharmacy and advanced care planning. and provides further instructions as to what information to include in a referral to Flying Doctor Telehealth.